Prominent & Leading Manufacturer from Mumbai, we offer lab ultrasonic cleaners, ultrasonic bath sonicator, ultrasonic bath with chiller, pharma ultrasonic cleaners, barrel ultrasonic cleaner and ultrasonic cleaners. Athena Ultrasonic Bath Sonicator. The offered sonicator is widely used in quality units, R&D and analytical labs for cleaning purpose. The offered sonicator is manufactured under the guidance of our dexterous professionals using optimum grade components with the help of progressive technology. Our offered sonicator is highly acclaimed among our patrons owing to its high functionality and smooth operation. 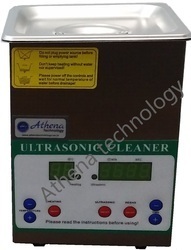 Athena We are one of the reliable Manufacturers, Suppliers and Exporters of Ultrasonic Sonicator Bath. Sonicator Bath has been designed using MOSFET/IGBT and latest Microcontroller base technology. 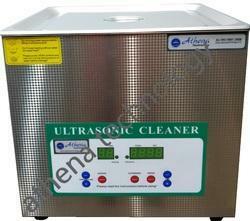 Ultrasonic Bath is used to fulfill all cleaning needs of the labs. Ultrasonic Sonicator Bath is used in QC, R&D and analytical labs, scientific and pharmaceutical labs. The use of Ultrasonic Sonicator Bath offers gentle yet effective cleaning action ensuring that no contaminants are left from the previous process. Our professionals have achieved dexterity in manufacturing higher capacity degassing sonication Bath. Further we provide customized production facility for our customers. Industrial : Semi-Conductors, Electronic Components, Precious Parts & Mechanisms. The principle of the ultrasonic cleaning process is as follows: Piezo electric transducers are attached to the cleaning tank. They generate ultrasound waves that vibrate the cleaning fluid at very high velocity, creating a process called cavitation. Millions of tiny bubbles implode within the solution and penetrate into every orifice of the item being cleaned, removing dirt and grime within seconds. Our in-built chiller unit when set to a desired temperature from 5-20 deg. Cent. can keep the sample cool. Ultrasonic Generator will generate heat during the process of cleaning. To control the heat a Chiller System is provided from outside the Bath. The chiller provided in the Ultrasonic Cleaner Regulates the temperature and keep the machine in good condition for a long functional life. The chiller provided in the Ultrasonic Cleaner regulates the temperature and keep the machine in good condition for a longer functional life. 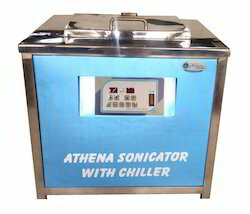 Athena Technology, one among the prominent manufacturers and suppliers of supreme quality Ultrasonic Bath with Chiller that is manufactured in accordance with the predefined industry standards. Extensively used in labs, it has fetched high demands in the market. The offered product is further highly regarded for its in-built chiller unit and a longer functional life. 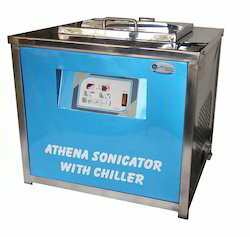 Athena We are one of the reliable Manufacturers, Suppliers and Exporters of Ultrasonic Sonicator Bath. Sonicator Bath has been designed using MOSFET/IGBT and latest Microcontroller base technology. 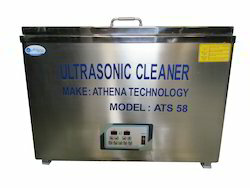 Ultrasonic Bath is used to fulfill all cleaning needs of the labs. Ultrasonic Sonicator Bath is used in QC, R&D and analytical labs, scientific and pharmaceutical labs. The use of Ultrasonic Sonicator Bath offers gentle yet effective cleaning action ensuring that no contaminants are left from the previous process. Our professionals have achieved dexterity in manufacturing higher capacity degassing sonication Bath. Further we provide customized production facility for our customers. Input voltage range of 170V AC - 270V AC, 50 Hz, l Ph. Micro controller based timer range 0 to 15 minutes upto 3.5 ltrs. 30/99 min. timer are also available. Easy to operate & made of one piece S. S. Tank. Indigenously manufactured with advanced MOSFET technology, with Auto-tuning facility. Digital Tuning of Transducers with Generators to avoid any frequency shifted even during demanding applications. Compact, rugged and highly durable systems. Smash, emulsify, scatter, hydrolyze, extract, degass certain analyzed objects in labs. Ultrasonic Cleaners, Digital Ultrasonic Cleaner Being one of the eminent names of the field, we are engaged in offering Digital Ultrasonic Cleaner that is used in electroplating, electronics, automobiles and machine tools. These efficient cleaners are capable of removing dust, wax, flux, dirt, rust, finger prints and grease. They proposed range of sturdily constructed and reliable cleaners is available in multiple specifications. We offers a wide range of Ultrasonic Cleaning with Cleaning Chemical selection for achieving the required cleaning results. Power Ultrasonic Oscillations produced by a Solid State Generator are converted into Mechanical Vibrations by PZT Transducers. These vibrations produce intense scrubbing action throughout the liquid media which in turn pulls out the contaminants from hidden recesses and crevices of complicated assemblies. Ultrasonic also accelerates chemical action of the cleaning media (Water and Solvents). Our comprehensive range of standard and custom built cleaners will meet all your cleaning and degreasing application needs. Automatic Ultrasonic Cleaning Machine. The most significant gem from our range is multi chemical Automatic Ultrasonic Cleaning, which has its utilization in multi chemicals, cleaning, anti rusting, rinsing and hot air drying. The circulation system of machines finds their specific usage for cleaning inner sides of hollow components. It has full automated process control with variable process time selections for individual chemicals/rinses, which ensures 100% cleaning and fastly work. Ultrasonic Cleaning Machine. We are enlisted amongst the leading names in the industry, offering a technically advanced array of Ultrasonic Cleaning Machines that are widely acknowledged among the clients for seamless performance and durable standards. Our entire product range is easy to use and is acclaimed for high functionality. We are one of the renounced company engaged in manufacturing and supplying a wide range of Ultrasonic Cleaning Equipment. These machines are intended with fully solid state microprocessor controlled unit, digital timer and intensity display. We use of high quality raw material which not only adds durability to our products, but also makes them corrosion resistant. We offer a unique range of Cleaning Machines that are highly demanded for their excellent performance and low maintenance. With our immense domain expertise, we are involved in offering Cleaning Machine to our valuable clients. This machine is designed using supreme class base component and cutting edge technology at par with international standards. Moreover, we offer this machine in different specifications and can also be customized as per the needs of the clients. In order to deliver flawlessness range, it is tested on various predefined quality parameters. Ultrasonic Cleaning Systems Single Tank Ultrasonic Cleaning Machines have a single chamber cleaning process. This means that cleaning of the product/component is done within a single tank chamber. In case of rinsing & drying of the component is required, additional fixtures can be fabricated upon special requirement. In a typical aqueous ultrasonic cleaning system, it is the cleaning stage(s) that will remove or loosen the contaminants. The following rinse stage(s) remove any remaining loosened soils and residual detergent, and a dryer removes any remaining rinse water. Sonicator Ultrasonic Bath Backed with rich industrial experience, we are engaged in offering superior grade Sonicator. The offered sonicator is widely used for cleaning different products like jewelry, lenses, watches, optical parts, surgical instruments and number of electronic equipment’s. This sonicator is precisely manufactured under the strict supervision of our diligent technocrats using supreme class components as well contemporary technology. The provided sonicator is thoroughly examined against several parameters to eliminate any possible defect. Sonicator Bath Ultrasonic Cleaners will save time and reduce effort while providing a safe solution for your cleaning needs. 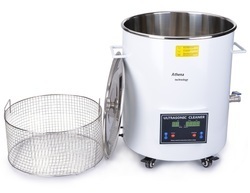 Now – A – Days Ultrasonic Cleaner is essential tool for Scientific & Pharma Labs. There are many uses of ultrasonic cleaner in QC , R&D & Analytical Labs such as, Dissolve, disperse, and emulsify samples Sonochemestry i.e. degassing the solution Cleaning the glass ware , Lab Instruments Sonicator Bath Ultrasonic Cleaner (Sonicator) has design with MOSFET /IGBT & latest Microcontroller base technology. Being a client centric organization, we do not compromise with the quality of offered Ultrasonic Bath Sonicator. To manufacture these bath sonicators in compliance with industrial standards, we source supreme quality components from authentic vendors of the market. Well-known among our clients for their compact design, rust proof finish and unmatched performance, ultrasonic bath sonicator is widely used in QC, R&;D, analytical labs, pharmaceutical and scientific labs for cleaning the glass ware and lab instruments. IN these sonicators, the cleaning is formed by hot air, IR and vacuum drying processes. 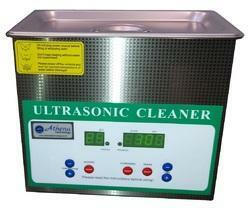 We provide Ultrasonic Bath Sonicator with the principal of ultrasonic cleaner. It is a high frequency electrical energy that is converted into ultrasound waves by means of ultrasonic transducers, which are bonded on the base of S.S. water tank. The ultrasonic bath sonicator are high frequency sound waves that are created in the liquid countless, microscopic vacuum bubbles, which rapidly expand & collapse. This phenomenon is cavitation. The bubbles act like miniature high speed brushes, driving the liquid into all openings and minutes recesses of the object immersed in the liquid. Excessive scrubbing of cavitation cleans away all the dirt and soil from the object immersed and the object is effectively cleaned. An intricate object can also be completely cleaned or by little dismantling. Extensively protected electronic, circuits means longer and safer operations. Industrial: Semi-Conductors, Electronic Components, Precious Part & Mechanisms. Medical: Dental & Surgical Instruments. To Remove: Dust, Oils, Grease, Polishing Compounds, Waxes, Swarf, Stains, Soils and any other contaminant. Bestowed with a skilled team of professionals, we are able to offer an extensive range of Lab Sonicator. This sonicator is used for cleaning the glass ware, Lab instruments Dissolve, disperse and emulsify samples. Making use of premium class components and innovative techniques, the offered sonicator is manufactured under the strict guidance of adroit professionals at our well-established production unit. The provided sonicator is widely admired by our honored clients for its smooth operation. 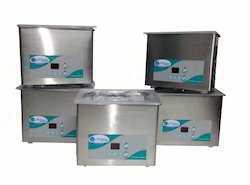 Ultrasonic Cleaner is used in QC, R&D and analytical labs, scientific and pharmaceutical labs. Using quality approved components with the assistance of ultra-modern methodology; this cleaner is perfectly manufactured under the strict direction of our talented workforce at our well-equipped production unit. In order to ensure its quality, this cleaner is stringently checked against several parameters of quality by our quality examiners. We are proficient in the manufacturing and supplying of best quality Glassware Ultrasonic Cleaners. Known for their resistance to corrosion and alkali, the whole range of the glassware ultrasonic cleaners offered by us is highly popular among the customers we have. Committed to the satisfaction of our clients, we assure an optimum range of products for our revered clients. We are involved in the manufacturing and supplying of premium quality Optical Lens Ultrasonic Cleaners. Widely used in hospitals, it is highly acclaimed among our client-base spread across the nation. Subjected to quality checks on various parameters, the entire range of the ultrasonic cleaners offered by us is guaranteed of utmost quality. 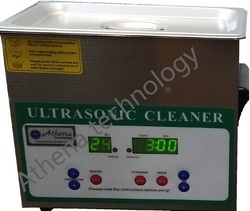 Ultrasonic Bath Sonicator Athena Manufacturer & Supplier of Ultrasonic Cleaner For Medical industry. Our product range also comprises of Ultrasonic Cleaning Systems, Ultrasonic Cleaners and Ultrasonic Equipment. We are counted as the reputed manufacturer and supplier of high quality Ultrasonic Cleaner for Medical industry that is manufactured in adherence to the industry set standards. Highly regarded for removing grease, dust and oil, it is highly appreciated among the customers we have. The whole range of the ultrasonic cleaners offered by us is further known for its low noise operation and long lasting life. 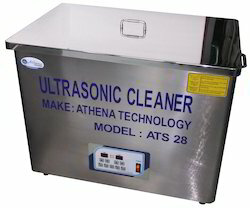 Ultrasonic Bath, Athena We are one of the reliable Manufacturers, Suppliers and Exporters of Ultrasonic Sonicator Bath. Sonicator Bath has been designed using MOSFET/IGBT and latest Microcontroller base technology. 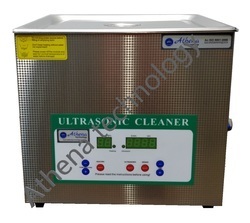 Ultrasonic Bath is used to fulfill all cleaning needs of the labs. Ultrasonic Sonicator Bath is used in QC, R&D and analytical labs, scientific and pharmaceutical labs. The use of Ultrasonic Sonicator Bath offers gentle yet effective cleaning action ensuring that no contaminants are left from the previous process. Our professionals have achieved dexterity in manufacturing higher capacity degassing sonication Bath. Further we provide customized production facility for our customers. Higher Efficiency Solid-State Circuits. With Auto-tuning Facility. Operating Frequencies 36+-3 Khz or 22+-3Khz. However for all General purpose Cleaning 363 Khz is highly recommended. Ultrasonic (Ultrasound) is the sound which human beings cannot hear. Ultrasonic utilizes frequencies from and above 18 Khz (18000 cycles per second) High frequency electrical energy is converted into ultra sound waves by means of Ultrasonic Transducers, which are bonded on the base of S.S. Cleaning Tank. These high frequency sound waves create in the squid countless. Microscopic Vacuum Bubbles, which rapidly expand and collapse. This phenomenon is CAVITATION. These bubbles act eke miniature high speed brushes, driving the liquid into all openings and minute recesses of the object immersed in the liquid. Intense scribing of Cavitation cleans away all the dirt and soil horn the object immersed and the object Is perfectly cloned. Intricate objects can be cleaned with either complete or little dismantling.